I’ve been reading a fair bit of Coraline Ehmke’s writing in the last couple of days after her post about her year at Github went viral. Which lead me to her post on Model View Culture, The Dehumanizing Myth of Meritocracy. I haven’t thought about Utilitarianism1 in a long time, but I have for that time considered myself one, passively at least. The article has made me reconsider that. For a good long time, Batman was my favorite superhero (don’t really have one anymore). His brutal utilitarianism and dedication is very compelling, and you get some amazing human dramas out of him in the hands of a good writer. 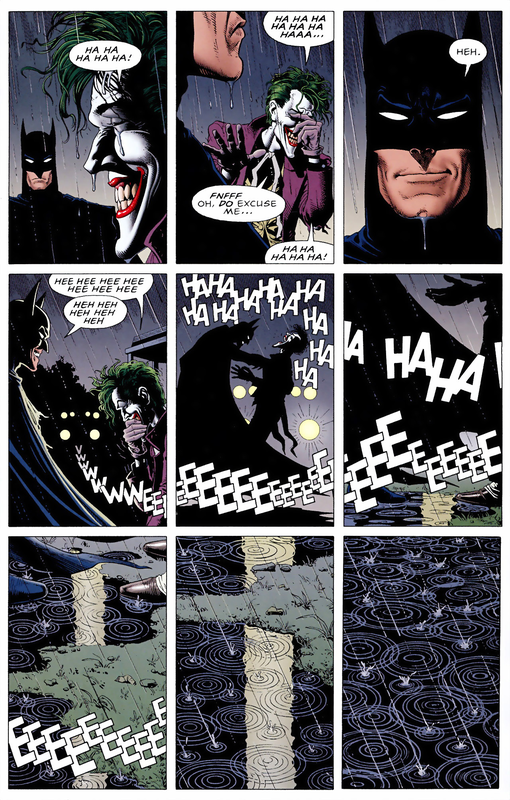 The laughing panel at the end of The Killing Joke still gives me chills. This moment resonates, not because Batman finally kills the psychopath who has been terrorizing Gotham and the Bat-family, but because he finally gives in to his messy humanity. And for a long time, yea, I’ve been a utilitarian. I have admitted and held my ground in arguments that I would sacrifice the one person in the trolley problem to save the many–whether it was a switch, or I had to push them, or shoot the driver–whatever the formulation. But it occurred to me while reading Ehmke’s article on Meritocracy that there’s an inherent flaw in utilitarianism. It seeks to do what is of the most benefit for the most people, regardless of the sacrifice made by the few. Which if you’re sacrificing yourself sounds heroic… and may or may not be the right thing to do. But it’s a hard sell to decide for someone else they need to be a hero. The bigger problem though, is that utilitarianism can be self-defeating. Given a group of 10 people, who for whatever reason continually find themselves in the trolley problem, even if you choose to kill the one every time, and then run it again… that population of 10 will very quickly shrink to one. Which is a pretty trite formulation (why the f*** are these people always getting on a trolley that has proven itself to be a murder machine? ), but you can scale that up. It wouldn’t be hard to imagine a scenario in which you were talking about larger populations in real-world dangerous circumstances, and having to make sacrifices. But if you do it enough, you could eventually drop the population below the number necessary to maintain genetic diversity. BSG danced around this issue a few times… though it kinda got handwaved at the end. But if the breeding population is sufficiently depleted, you’re in a situation where even the majority is now suffering. So yea… utilitarianism could totally eat itself from the inside. It doesn’t always have to be about genetic diversity or super heroes. I think Ehmke is right to insist that we consider the fact that we are humans. It’s important. It’s the only way to preserve our own, as well as each other’s, value as a creature, and the only way to avoid becoming numbers that can be sacrificed in front of trolleys.